I got a whole pumpkin at home. I was thinking about baking bread with pumpkin. But I didn't want make just a pumpkin loaf. I wanted to make fancy one. 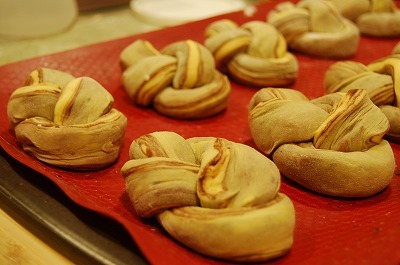 I made them double knot shape. 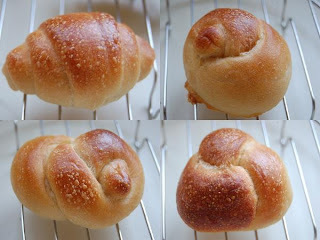 Here, I got some, how to shape rolls. 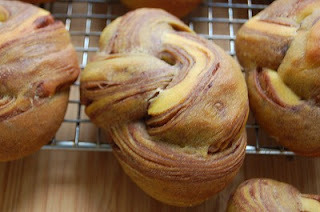 I made pumpkin sweet dough, then folded the chocolate sheet. The chocolate sheet is made from flour, corn starch, egg white, chocolate and so on. It is quite easy to make. I made it the day before baking. Put it in the fridge, and rest it there. It looks really nice. 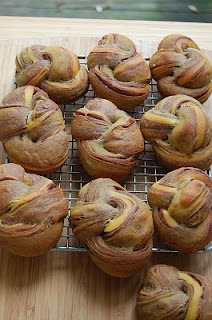 The rolls got yellow orange and chocolate brown marble color. Pumpkin contains water, so you need control liquid on the dough making. It might be more or less. These are sweet rolls. They could be good at breakfast or tea time. I got how to make chocolate sheet, here. But This time, I made it without microwave. I used gas stove. 1. In a small sauce pan, sift ★ingredients and combine well. 2. Add milk and stir with whipper well. 3. Heat it at low heat. Stir well. Add chocolate and butter, combine together and melt them. 5. Heat it at low heat. and stir well. 6. Stir with a spatula. It becomes a dough gradually. 7. Place it on the plastic wrap and cover with another plastic wrap. Roll it 18cm x 30cm, put it into the fridge. 1. Place flour, egg, milk,pumpkin, yeast, sugar and salt in the bread mixer. Mix it about 10 minutes. Add butter and mix it another 8 minutes. 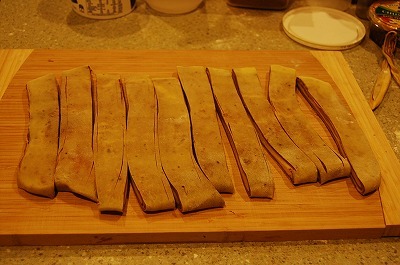 The dough becomes very soft and extensible, elastic. It can be stretched a paper thin“windowpane” . 2. Transfer the dough to a covered container and ferment at warm room temperature (about 27℃) for 1.5 - 2 hours till it becomes double size. 3. 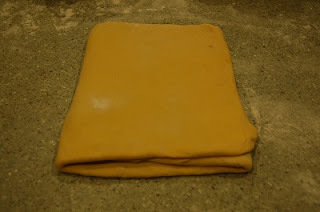 Pour the dough onto the floured counter, then deflate it, knead it briefly. 4. Fold the chocolate sheet. A. Roll it out 20cm x 45cm . 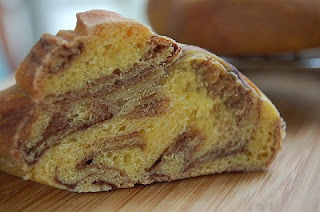 Place the chocolate sheet on the dough. B. Fold 1/3 right side and 1/3 left side. E. Roll it out 20cm x 40cm. F. Fold 1/3 right side and 1/3 left side. Repeat D - F, again. 5. Wrap it up with plastic wrap. Place it at the fridge for 40 - 60 minutes. On the floured counter, put the dough. Roll it out 20cm x 30cm. Cut it into 10 pieces (3cm each). 7. Roll and make it 30cm cylinder. I. part-a is going to front. part-b is going to back. J. Place it on the baking tray. 8. Place them on the warm place for 40 - 60 minutes. Meanwhile preheat oven at 190℃. Spray water before bake them. 9. 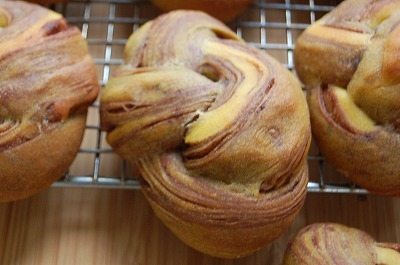 Bake them at 180℃ for 10minutes and 170℃ for 10minutes. 10. Cool them on the wire rack. It is placed at Yeastspotting. My name is Margarita from Spain. I found your recipe via Yeastspotting and I tried to do it this weekend. I used 1 egg, 100ml milk and 130 pumkin. Is that correct ? thanks for trying my recipe. I am glad to hear from you. actually, i forgot to write down how much pumpkin I add. 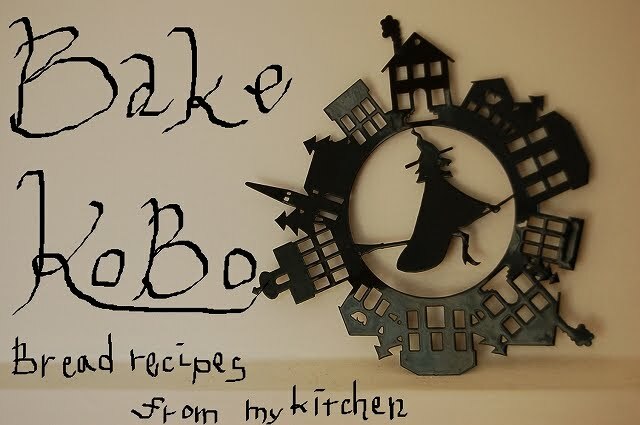 I used 100g of mushed pumpkin. pumpkin was quite soggy. So you need control liquid ingredients, egg and milk. I used 1 egg(beaten) and milk. the weight of egg and milk is about 100g to 130g. it depends how pumpkin is soggy. I´ll try again with your indication.